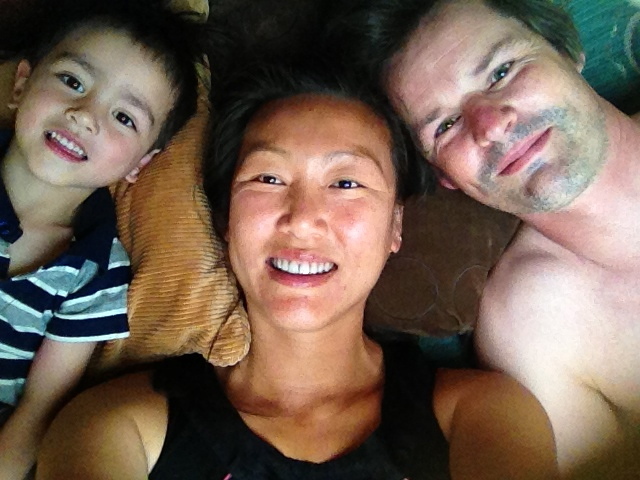 On the 29th Kien turned 3. This Saturday 29th was also significant - we took Cariere out for the first time. It was also my first sailing experience, ever! Passing Musik Point on our way out from Half Moon Bay. We headed out without really having a destination in mind. Jef suggested anchoring at Motutapu Island since we were almost there, but then I decided to go to Motuihe Island instead. It was us and a zillion other boaties. 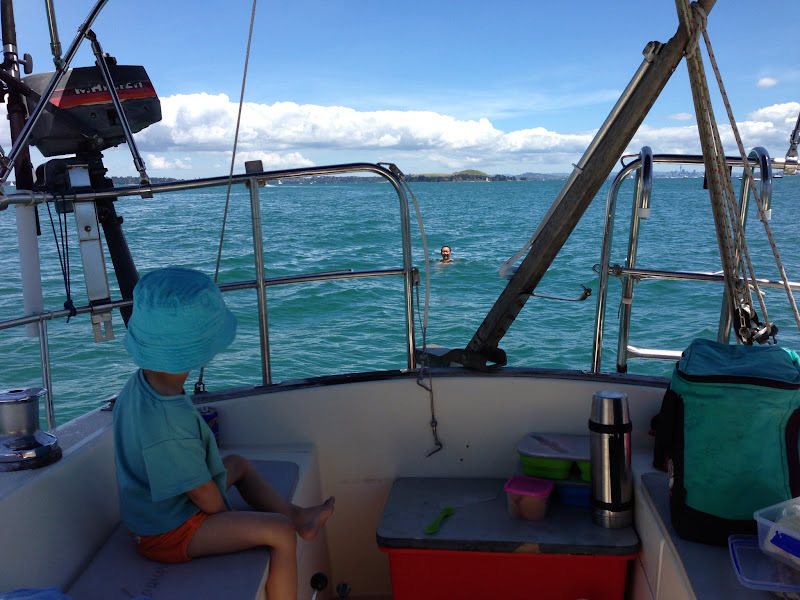 It is official - Kien gets sea sick. He tells us he doesn't feel well, and then we'd better have something handy to "catch". But afterwards he is in good spirits, so that's a relief. It was such a wonderfully warm day, so I had to go overboard. I love sailing. It feels like such an adventure! On our way back the wind picked up, and the boat was leaning over quite substantially. Kien was in the cabin fussing over his milk, and after multiple failed promises of "Baby, I'll be there real soon, just hold on a bit", all was quiet. Thank goodness! 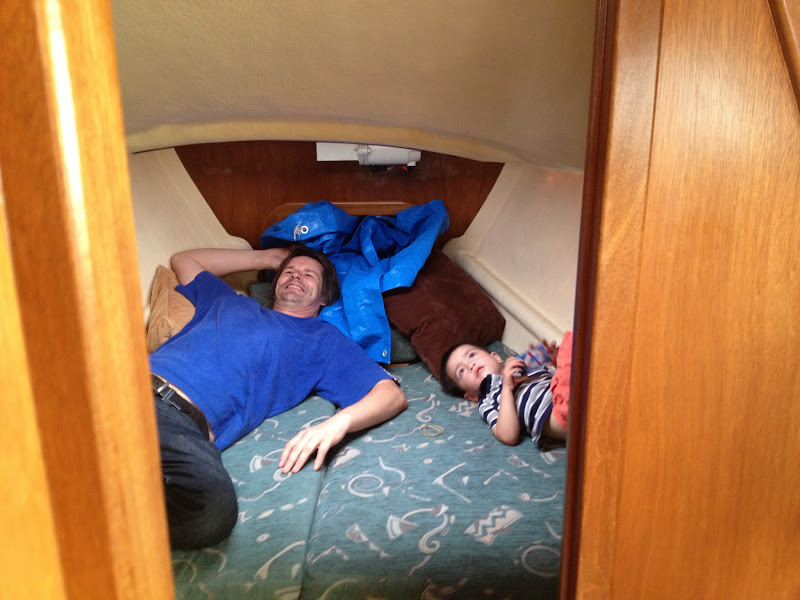 We needed him to stay below deck and it was a good thing he was so exhausted from the salt air and adventure. That night we sang him a little tune. Then we did it again, and again, and again. I put him to bed that night and told him how much I loved him, and how this time three years ago he changed me forever. I told him about being at Birthcare and him lying next to me, and how different it was to have him outside of me instead of inside. I remember it vividly, and I felt so privileged to have him in my arms. I still do. My baby, my little boy, how much I love you! Welcome to your fourth year. Christmas morning, and it could have been any other morning as far as Kien was concerned. We had told him to go check under the tree to see if he got any presents. Nope, he would much rather watch Josh and Josh flying helicopters on flite test. After lazing around the house until almost midday we got ourselves dressed and ready to head to my folks place, and literally had to persuade Kien to seek out his presents under the tree. Then he sat there and stared at them for a while. Yes, Kien, those are your presents. Go get them! So he lined them up on the table and carefully unwrapped them. Pure delight when he saw what was inside. For the past three years of Kien's life my family has always celebrated his birthday on Christmas day. My parents are workaholics - they never close up shop unless they have to, and as Christmas day is so close to Kien's birthday (plus the whole family is all gathered at the same place) it just makes sense to celebrate his birthday and Christmas all at once. 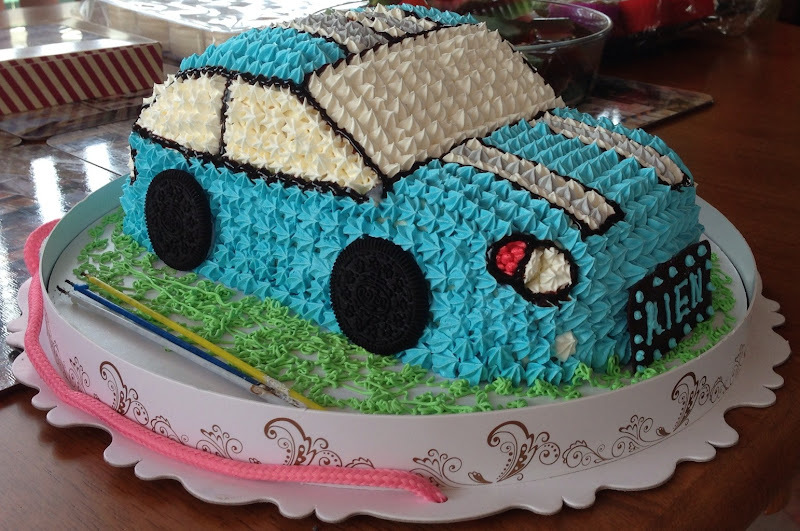 My younger sister ordered this awesome cake for him. 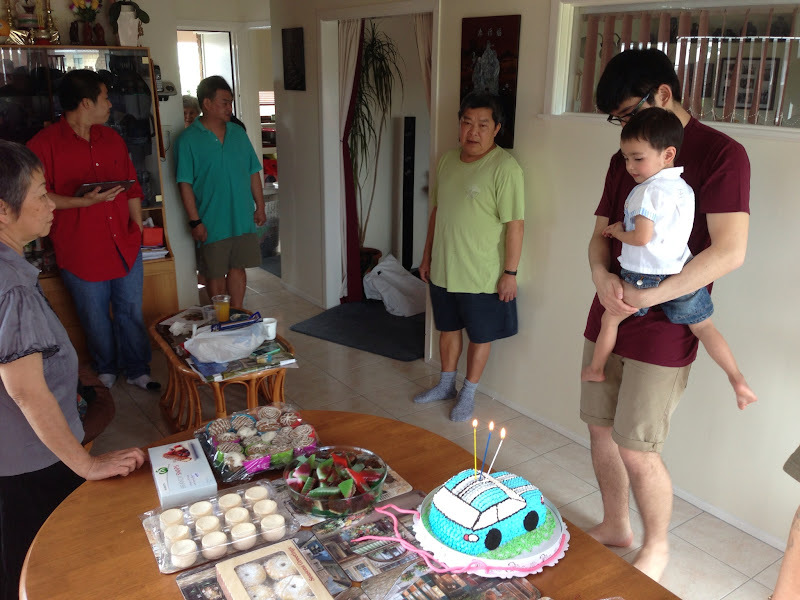 After the cake cutting (everyone was way too full to eat any of it) Kien was showered with more gifts. His ông ngoại helped him with the unwrapping as he was more than happy to have them remain wrapped up. You can definitely tell he is an only child, right? Absolutely no competition or comparisons whatsoever. Kien, you are one extremely lucky boy! Just wait a couple more days until it is your real birthday. You'll get to spend it with your two most favourite people in the world (Mummy and Daddy, of course! ), and you get to play with all your new toys you got on Christmas day. I'm thinking you'll want to blow out a candle, and ask to do it again, and again, so I'll be sure to have a tea light available for you. Unless it's two bite sizes I'm pretty sure you'll spit out the rest of whatever cake I give you, so I'm thinking a muffin or chocolate danish from New World will suffice. We'll spend the day on the boat, maybe out in the harbour or in one of the bays on an island out in the gulf, and I know you will love it! Jef decided this year he was going to give me something really special. I decided this year I was going to give him something really special too. We went to unwrap our present today. It was very exciting trialling the different berths. Who's choice is which? Maybe we all pile in together! I was fun discovering what other little "toys" are onboard. I can't wait to take our Christmas present for a spin. Kien was keen to get going too. He's practicing his deckhand skills. Or maybe he just wants to be the skipper? It's a crazy time of year, isn't it? I'm so very glad we are now on holiday for the next two weeks. I thought I'd catch up with some bits and bobs that we've been up to for the last couple of weeks. We put up a tree at the beginning of the month. Jef made a cool rig to secure the tree, and Kien and I decorated the tree the following day. The weather has been fantastic (prior to today, that is). So summery and lovely. So last week I tried to get out for lunchtime walks a couple of times. Lots of work functions for both Jef and I. My work function was a private concert with an awesome lineup, including Dave Dobbyn, Anika Moa, Boh Runga, Hollie Smith and the Black Seeds. We had such a great night out. We've also been to see the Telecom Christmas tree a couple of times over the last few weeks. One beautiful evening we scootered Kien down to Victoria Park. The boys also used the skate ramps as slides. General merriment was to be had at and near the tree. So it is now the beginning of Christmas Eve and my household is quiet. It hasn't been quiet for some time. Oh boy, Kien has been trying as hard as he can to test our patience and stamina. 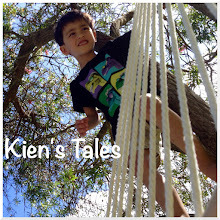 I've been doing a bit of research and it sounds like Kien is going through the 3 year growth spurt. So the poor kid is experiencing growing pains. But he's also testing the boundaries. Yeah, it's been hard, really hard. I'm hoping things will even out soon.